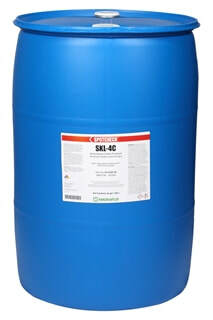 Specially designed for chemically sensitive plastic parts, and for leak detection, SKL-4C is a red dye visible penetrant that is water based and water washable. As with most plastic parts, it is recommended that a trial application be used to confirm compatibility. Indications appear dark purple-red in visible light and fluorescent orange in ultraviolet light. This allows dual range flexibility in the inspection process. SKL-4C can be diluted with water, although it is recommended that a dilution ratio of 1:1 is used for general purposes.